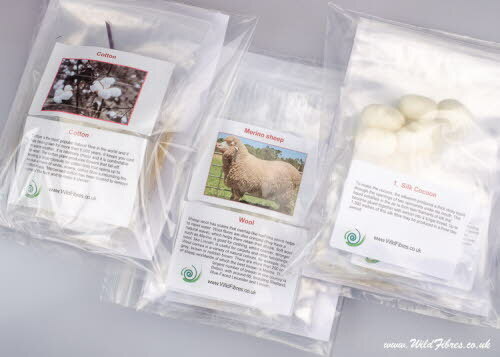 Save £3.50 by buying all three fibre packs together: animal fibres, plant fibres and silk fibres, making a total of 25 samples, including everyday fibres such as merino wool, cotton and mulberry silk, as well as more exotic samples such as yak, kapok and tussah silk. Great as a teaching aid for textile students and home learners and therefore a must for schools, colleges and universities teaching textiles or the fibre arts and crafts. These packs are irresistible as samples for fibre lovers and would make an exciting and unusual gift.